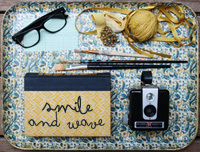 Smile and Wave: Lisa Leonard Giveaway! Lisa Leonard has generously offered to share something pretty with Smile and Wave readers! She's been designing and hand-crafting silver jewelry for years and has most recently teamed up with Ali Edwards and designed the Word of the Year necklace to capture that word that sums up what you want in 2011. 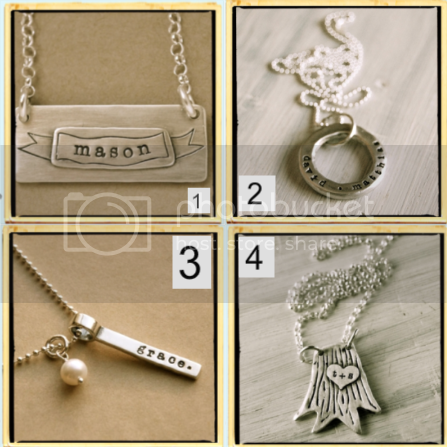 Lisa's high quality designs can be customized with names and initials and are a great choice for a meaningful gift. Lisa would like to give one lucky winner $50 worth of shop credit to Lisa Leonard Designs! To enter to win this giveaway I'd love to hear what you're most hoping for in 2011. Comments will be open until the 20th when a winner will be picked. To ensure that you'll receive your prize please leave a way for me to contact you in your entry as we've had a lot of unclaimed prizes in recent giveaways. Thanks for your readership and thanks for the great giveaway, Lisa! I am hoping to open my own little Etsy store this year - time to get creative! I hope that this is the year that I have the willpower to lose weight and get healthier. I hope to go on more adventures, even if it's just little day trips! I really hope to get back to what is really important. To focus on my family, eating healthy, spending time together and try to live each day so that when I look back on this year I don't say to myself I should have done it differently. Beautiful! I'm most hoping for the confirmation that I will actually be starting grad school in the fall. Oh my! i'm hoping for the ability to carryout fun new crafty endeavors. I hope to become a mom again. I'm looking forward to graduating with my B.A. Ohhhh How fantastic!! I adore everything about this!! Thanks bunches for this fab giveaway!! Love from the nj shore! i'm hoping that my family will stay healthy, positive and relatively happy while we finish up on the foreclosure of our house. I'm hoping for more balance in my life this year. I'm also hoping my Etsy shop will take off a bit more. Without taking for granted, in 2011 I'm most hoping for a clean bill of health for our family. I'm hoping that this year will be a little better than last year! In 2011 I am hoping to be able to live in each moment and savor the time with my 10 month old as I know it will go too quickly! I am hoping this year to get my life in order and start living my life and doing things i want to do. I hope for peace of mind this year. I am hoping to be more spontaneous and go on fun adventures with my friends! I'm hoping to enjoy each and every day with the little people in my life and my sweet hubby. Hoping this year will be the year of getting organized. My grandma passed away 3 years ago and I have yet to find a place for some of her stuff (as the executor, there is a lot of paperwork involved). Also, I'm hoping this will be the year of wearing some gorgeous Lisa Leonard jewelry!! I am hoping to be one year closer to graduating with my law degree... then I'll be almost done! I'm hoping to learn how to sew so maybe I can open an Etsy shop, just like the bloggers I follow that inspire me. I am hoping to learn more knitting stuff and make straight A's this semester. I love her sweetheart necklace. The word for the year necklace is fabulous. In years past, when I was single and in my twenties, I would have picked reciprocity and validation as my words. But now, on my 5th year of marriage I think I would pick passion as my word. I'm hoping that this year will be full of creativity and success for my husband and I. I want him to write many many poems (he's a poet who teaches english at a university) and I want to make many many pretty things and maybe a baby too. I'm hoping this is our lucky year. 11 is my lucky number. I am hoping to stick to my resolutions, and do really well in school! Guilt free creative time since I will be finished with school this year! I hope to take action on some of my ideas this year; going back to school and opening my own Etsy store. One down, one to go! marvelousmama (at) gmail (dot) com. I'm hoping to live in the now, enjoy the stage that my boys and family are in and not wish away the days. Even when it isn't very glamorous, which it almost never is. my hopes for 2011 are continuous health, contagious laughter, and constant love for my family. I am hoping for a safe & healthy delivery for our first, very anticipated child! it may sound cliche, but i'm a-gonna say it anyway. the thing i am most hoping for this year is ... love. i've had a good long break from it (and all boys) for some old-fashioned healing and i'm ready (again) i'm ready to offer my heart for some man's hands to hold. I have a top secret special project that I am planning with some partners. Hope that it happens for us this year! My goal for this year is to simplify my life. I want to live an uncluttered life so that I can spend more moments with my children and not have too much "stuff" to do. LOVE lisa- thanks for the giveaway! I'm hoping for trust, simple as that. In 2011 I am hoping for a beautiful natural birth, a new home and courage to explore my creativity! I am looking forward to a little more balance with family, work, friends, crafty time, etc. I am most hoping to stay in the home we're in now for 2011! It's the best place I've ever lived and I don't want to move ever! Oooh! Lovely! I'm hoping to transfer schools this year!! 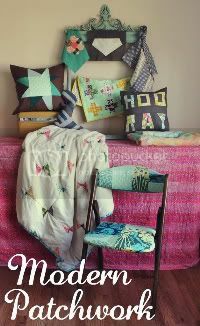 This year I'm looking forward to decorating my craft room and making it into a super cute and inspiring space! I would like to spend lots of time creating this year! 2011 is the first year I won't be in graduate school, so I'm ready for what life has to throw at me--I can't wait! I'm hoping to lose weight and to get more healthy. Hoping to spend tons of quality time with my family and make the most of every day! I'm looking forward to restoring my sense of self - and crafting more more more! And I love love love Lisa Leonard. Beautiful jewelry! This year I hope to be more organized! Great giveaway! This year is going to be tough but what i would love more than anything is to finally move out on my own and start my career! Jumpstart my business, while still in college! Love! I want to continue on this healthy living journey i'm currently on. I want it bad. In 2011, I'm hoping to grow in patience and contentment, and to become more fluent in Spanish. I'm hoping for a healthy itty bitty baby we just found out were expecting in September! I woul love a necklace with my new littles name!! Aaaah, balance. In all things: my crafting, marriage, kids, etc. To feel like I'm doing an equally good job at all aspects. I'm hoping for lots of peace and contentment. :) We have a big year ahead of us with lots of changes and moves possibly so I want to remain content through all of it. i'm hoping for financial freedom this year, as well as direction for growing my little business. I am hoping that all my hard work on my knitting and opening my first store will be worth it in the end. I'm just hoping for a happy and healthy little family. a more 'organic' life: natural, flexible, & beautiful. thank you for all the the beauty found here and for the rad giveaway! this year i hope to save enough money to put a good down payment on a house! I'm hoping to be better about giving my days in 2011 to the Lord. I know they're His anyway, but I'm a bit of a planner. I'm hoping to have my family closer. Should my dad get this new position, my parents and brother will go from 11 hours away to only 2.5! It's been tough only seeing them twice a year for the past three years. I'm hoping to get into graduate school this year.. and if not, to figure out something else to do. Yikes! im hoping for everything to fall into place to open my own etsy shop. Im also hoping for the strength to get through a 2000 mile move this summer! I HAVE to learn how to knit this year! And finish the quilt I've been working on for the past 5 years. I want to be a better person. I want to be a better wife and make fantastic dinners everyday. I want to be a better daughter and call my parents more often. I want to be a better student and get better grades. I want to volunteer and help others. I want to craft and make my life and my loved ones beautiful. Love the necklaces! Thanks for a great giveaway! I'm hoping to get my etsy shop up and running to a point where it becomes known much more than it is now. I'd like to be able to start selling at my local farmer's market and move towards selling a lot of my products locally. I'd love to continue working on my degree for school and learn to appreciate the simplest and sometimes most wonderful things that life has to offer. I am hoping that I remember how much I am loved by my friends and family. Lookin forward to my little Blake turning one! hmm..I'm hoping that my best friend will finally realize that he's madly in love with me. In the real world-opening my own Etsy shop! I'm bursting with ideas! i love lisa leonards designs. thanks for this offer. I am really hoping that my first year of University will go really well for me! The necklaces are so pretty! I'm hoping that the birth of my third child goes smoothly and that in 2011 all the good people that I know will be blessed and their lives enriched! Thank you for sharing your beautiful life with us! Thanks so much for this amazing giveaway! This year I hope I'll be able to pay off my debts and be able to follow my dream undistracted. This year I am hoping, now that our baby is getting older, for more time with the Husband. More date nights and maybe even a weekend away. Hoping to purchase our first home too! Such a lovely giveaway, thank you! I am hoping to spend more time playing this year! I'm hoping for a safe and healthy new year fir my family and friends. Last year wasn't so good so this year should be an improvement. On the lighter side I'm hoping to get more seeing in too. Thanks for the giveaway. I am hoping that in 2011 I can learn to be better at time management and use my time more wisely. That also includes making time for my etsy shop! I am hoping i find peace in 2011. I am hoping to embrace every opportunity that presents iteself, and to make some happen myself! My hope for 2011 is to be involved with a community who I love and adore and feels the same in return. I am most hoping to get to be a stay at home mom for my baby andnot have to go back to a 9-5! This is exciting; I love Lisa's work so much! That is all I need this year. Faith that all will be safe, faith that all will be calm, faith that all my loved ones will be together. What I'm absolutely hoping for most is a job! I've been looking for one for waaay too long! I am most hoping that my doctors solve my health problems and that I can buy the Honda Element I'm saving for! I hope that I will get a puppy and be more outdoors this year. In 2011 I'm hoping to feel healthier. I have spent the best part of a year feeling dizzy. I'm more than ready to be still and happy again. I'm also hoping to keep growing this exciting feeling of creativity. In 2011 I am hoping for easy labor as I am birthing my first baby! A boy! I really hope that my sister finds the confidence and the ability to do well in her interviews and exams and get herself a much-needed spot at university! Fingers crossed Stef! I am looking for more hope in 2011. Last year was rough, and nothing good starts without hope. I'd love to spend more time with family and friends, that's always the best gift. I'm hoping to do a project every week with my son. i made a project advent calendar and we had so much fun together. I'd like to keep the fun going with a planned project every week. I hope to find a job that I love going to every day, where I feel like I am making a difference in people's lives! i'm looking forward to maaaaybe a new job (but don't tell my current employers...) :) i check your blog all the time so in the event that i win, i will def. see it, don't worry! I'd love to finish my little fixer upper for good. I'm close......just a few rooms left with small projects! I am hoping to complete our adoption in 2011! We traveled/picked up our new son and daughter from Uganda in nov/dec- but we still need to finalize it here in the USA!!! I am now the lucky mom to a 7 year old home- grown, 3 year old home grown, and two three year old heart- growns! I'm hoping to get back into the routine of exercising on a regular basis. My year is filled with so much unknown and I am relishing in it. My hope is to go with the flow and keep peace in my heart. I'm hoping to step out of my comfort zone more! 2011 hopes...making steps towards having better communication with my son. he's one awesome little boy. we found out a few months ago that he has hearing loss and now has hearing aids. ready to have some conversations with him and not one word questions and answers. I'm looking to more "family peace" this year. Oh, such drama. I am hoping for a happy healthy new baby this july! I am hoping to take the GRE and go to grad school! I hope to take more pictures this year. Or improve taking pictures! I a hoping to watch my photography portfolio grow! This year I am hoping to continue on my travelling adventure, but maybe fit in a tiny little trip back home to New Zealand as well! Resolving to run faster unstead of farther and to sew my first quilt! I am looking forward to hopefully becoming a mamma for the very first time! I am hoping to be a crafting success and continue to watch my beautiful daughter grow and learn! I am hoping for less stress, to get my boy potty trained and a new kitchen floor!! I have been gushing over her necklaces for a year now! I hope I win! I'm hopping to have my love near me and find a job that I actually like. I'm hoping to better my photography skills, use Manual mode more than AV mode! that i am faithful to regularly go to the gym, and to read at night. My one little word this year is 'learn' and for me it has taken on a life of its own already. It's amazing what the intention behind a word can have when you say it out loud. My hope for this year then now is to take all those opportunities that I have to learn and take full advantage of everything they can bring to my life and not be so afraid of the things I don't know and doing things that I know will stretch me into a more loving, gracious and better version of me. 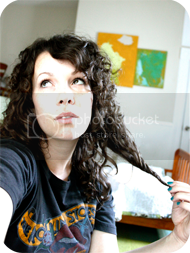 I really struggled in 2010 - health issues, losing my job, etc. I started a new job the beginning of January and I am praying that this year will be filled with better health, new friends, being more creative, and loving others better. i just want to be more open. if i had to choose one word for the year that would be it. open. "Cultivate" is my word for 2011, and I'm hoping to work on being intentional about growing and tending to the parts of my life that would be most enriching--relationships, career, hobbies, etc. I am hoping to be able to find joy in life, not just when circumstances are good - but in all things. I also hope to be able to be in the moment more with my children, instead of rushing to complete tasks - just sit and be with them in the moment. I hope to finish a big part of our remodel!! love that tree trunk necklace-so pretty! I'm hoping for lots of snow days! Gives me extra time to sew and be home with my pets. I would love to move some place new with this boy I love...adventure here we come. I am hoping to concentrate on the three things I wrote on my list of important things this year. Family, friends and home. I am hoping to Shine in every way this year. I am hoping to have a fresh change-of city, of weather, of mood, of job. I am hoping for a lot in 2011. Mainly, I'm hoping for safety for my husband who'll be deploying and bravery for my kiddo who'll be missing his dad. And I'm hoping for a bit of bravery for me, too, as I try to make the best of things. In 2011, I am hoping for peace of mind...something I've been spinning my wheels over for some time! LOL! I'm hoping to work on my writing a little more and really excited to learn how to use my new sewing machine!! let the crafting begin! That grace necklace gives me goosebumps! In 2011 I'm hoping to find myself. As a mother, a wife, a friend and a person. I hope to grow in love and patience for my children... things I can never have enough of! to hug more and be more huggable. I look forward to all of the changes in our family. I am hoping to be more aware in 2011...aware of what I need/want to live a fulfilled life. I also am hoping to be more aware of the thoughts and feelings of those around me. I'm hoping that this years chaos will only make us stronger. We have two kids a boy that is 4 and a girl that will be 2 in March, and we're expecting 2 boys at the end of this month!!! i'm hoping to grow my handmade business lots! I hope that I can successfully balance nursing school with work and my family. Im believing in gaining inner peace in 2011! I'm secretly hoping to get engaged this year! I'm hoping to bring in a little extra income to help the hubby! Lots of sewing! but i'll have a new born and a 1 1/2 yr old on my hands, so i hope to be able to balance everything and not go insane! I'd like more focus & self acceptance! i really love lisa leonard designs! i'm hoping that mine and my sailor-man's life doesn't change too much when his contract is up and we move back home to texas. we have a few months to figure it all out, but i'm nervous that we'll lose a lot of our privacy and independence. i'm hoping that i will finish more of what i start. i love your blog and i love lisa leonard's jewelry. and i would totally love to win! thank you for this giveaway, ladies. My goal this year is to really challenge and push myself in my creative business. I have some big hopes, and this year seems just perfect. In 2011 I am hoping for all the wedding craft projects I have been storing up to turn out all right and to be able to share in that process with friends! I'm looking forward to exploring my surroundings more as well as my closest relationships with family and friends. i am hoping to grow. and to be more disciplined in certain areas.. such as grow in my relationship with God & family & friends. and be disciplined in finances/spending & exercise. and hopefully, become pregnant at the end of the year! My goal for this year is to adopt a more natural approach to caring for my body. I actually have my first appointment with a naturopath tomorrow! I really want to make sure I know what I'm putting in and using on my body. I'm hoping to get the job I went for an interview for last week! I am hoping to take a trip to San Fran with my husband this year. He's never met my California family! I am most hoping to have peace in our family this year. i'm hoping to move in with my wonderful boyfriend (we're apartment shopping now! ), and to study abroad this summer! I am very much looking forward to the traveling I have planned for this year!